LivingRoc USA-The Blog: LIVINGROC HAS OUTDOOR FURNITURE!!!! LivingRoc has outdoor patio stone tables. Are you looking for natural stone marble, persian travertine or slate tables. Imagine mixing those beautiful materials with precision for an incredible and incomparable result. Let in the excellence within your homes environment with LivingRoc's natural stone patio and garden area tables and chairs. Our ALICANTE has a spanish influence, with a generous size of 49" or 63". The outdoor range is handcrafted and is suitable for all the lovers of fine materials in search of an extraordinary finish. Made in Spanish Marble (rojo alicante) and Persian travertine stone Alicante is sure to help make those special gatherings memorable. We have also included an umbrella hole for your comfort. Certainly one of the most beautiful colorful tables in our Patio & Garden Dining table range! 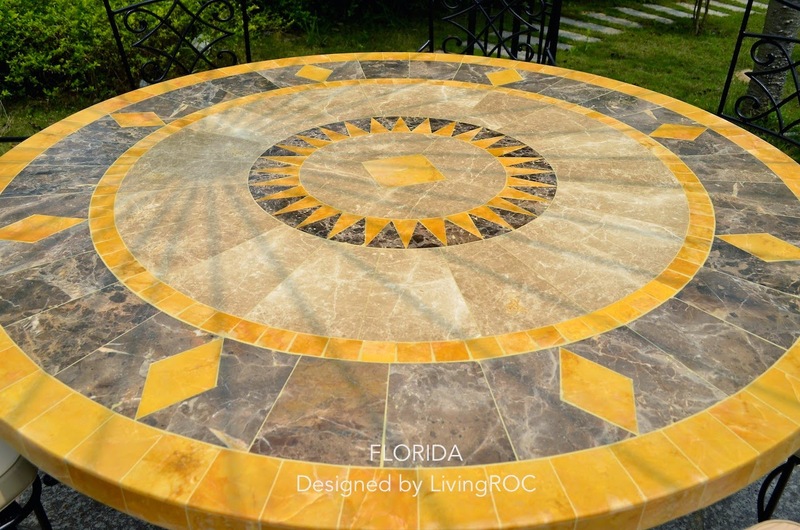 The Florida is our Outdoor patio table made with Dark Emperador Spanish marble and sunny marble cut with passion and its unique atmosphere it will bring you. Complete your project with one of our wrought iron chairs The DIAMOND. 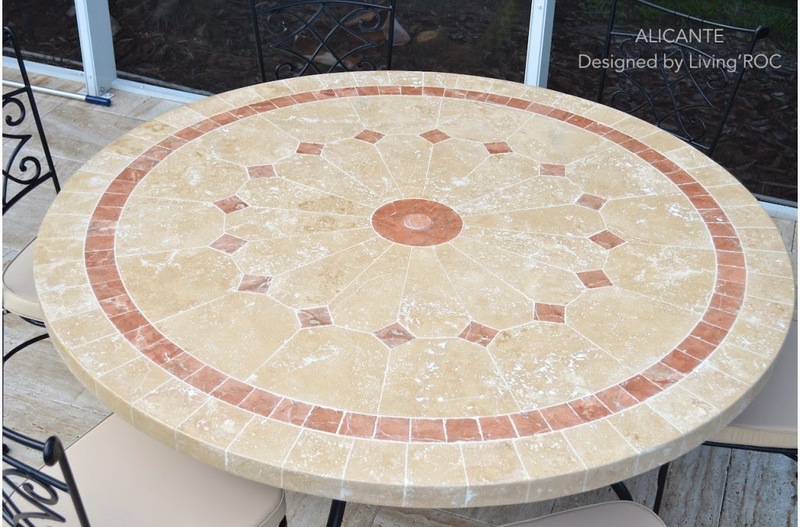 Mother nature is your guest with this beautiful Slate natural stone patio table MAPLE. Our tables can be used indoors or outdoors. Accommodating 6-8 persons. Made in natural slate, each piece is hand lain to perfection. Our Slate is multicolored and colors may vary from one plate to another in tones of gray, silver, brown, yellow, ochre, and topaz. Our Ovali will remind you the atmosphere of Spain. 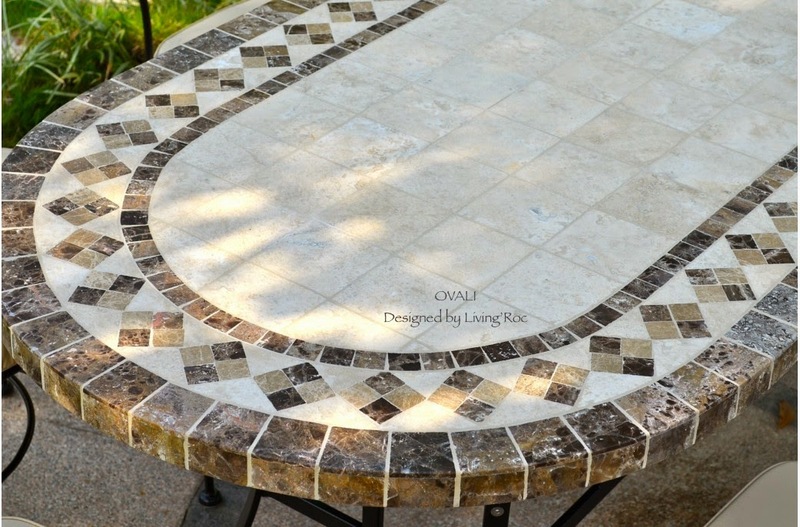 This natural tiled mosaic stone table cannot let you down with its rounded shape. With a wrought iron base this sturdy table is gorgeous, made with marble and travertine stones Ovali is sure to fit perfectly into your environment. 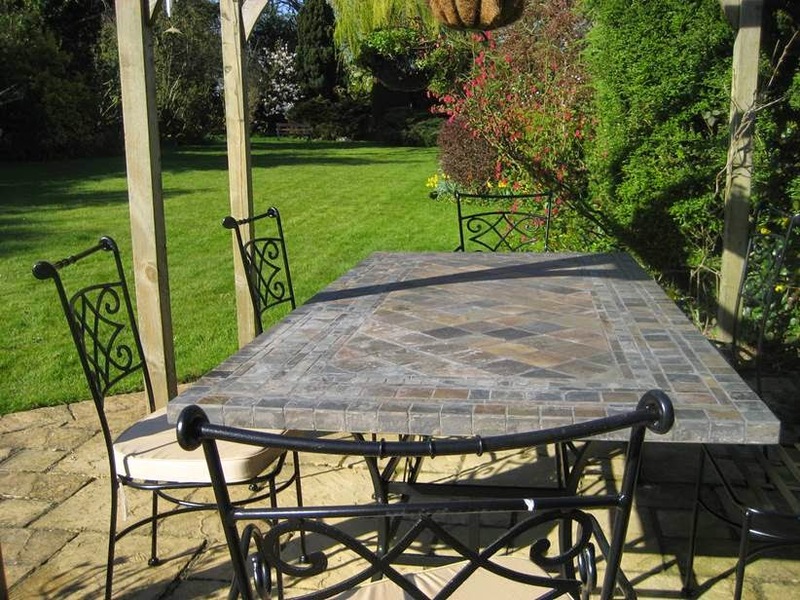 We invite you to have a look at what LivingRoc has for you Outdoor patio & Garden needs.